listen to the following radio stations. Altar of Fron Lutheran Church. At that gathering, it was decided to organize a congregation to serve people living in and south of the small village of Starbuck, Minnesota. This group of families had worshipped in various locations throughout the county but yearned to have regular, consistent opportunities for worship, education and fellowship with other Lutheran families living in the same vicinity. They chose to call the new group Fron Norwegian Evangelical Lutheran Congregation. The word Fron refers to a place in Norway where many of these families had lived. In Norway, the Fron area, called a Parish, is in the central county of Oppland. 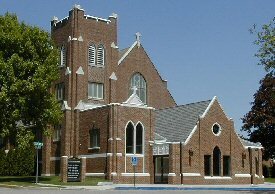 The first 100 years of Fron Lutheran Church were times of tremendous growth and change. The church went from being a small group with no home facility to being a large thriving congregation with a glorious facility. They persevered because they believed that families should be given the privilege to worship where they reside. The congregation grew because the people of Fron knew how important it was to make Christ known in the community, in the country and in the world.